SMD Technology provides these C7 LED retrofit replacement bulbs with more than double the brightness using almost 40% less energy (.58 Watt) than typical .96W LED replacement bulbs. UL listed for indoor and outdoor use. Improved brightness, more energy efficient C7 LED'S. SMD Technology is better all around. SMD (Smooth Mounted Diode) places the LED higher in the bulb to provide a brighter light using less energy. 2 diodes per bulbs, .58 Watt per bulb. Cool to the touch. 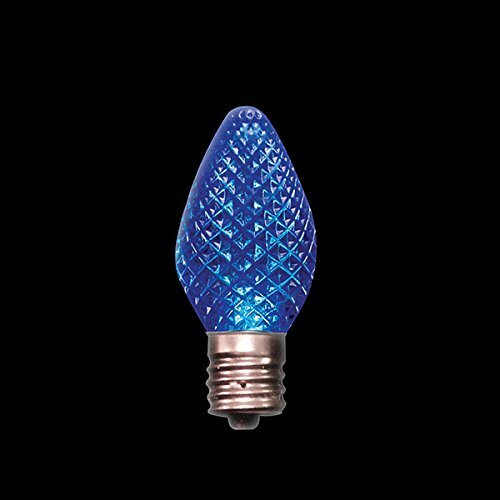 Break resistant bulbs never fade. If you have any questions about this product by Festive Holiday Lights, contact us by completing and submitting the form below. If you are looking for a specif part number, please include it with your message.